Buckle up, Disney fans because our first look at The Incredibles 2 is coming tomorrow. Reports started surfacing recently that the first trailer for the highly-anticipated sequel was going to arrive online in time so that it could be attached to Pixar's Coco, which arrives in theaters on November 22. 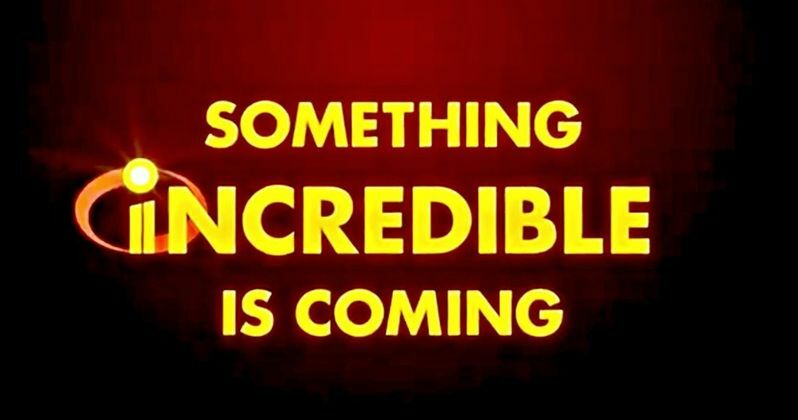 Now, Disney and Pixar have released a video, teasing the arrival of The Incredibles 2 teaser trailer online tomorrow. The video itself doesn't feature any footage from The Incredibles 2, though, it does feature a little bit of Jack Jack laughing, which is more than enough to get fans excited as this is a sequel they've been wanting for a very long time. The video features the classic lettering and color scheme from the first Incredibles, which was released in 2004 and remains one of Pixar's most beloved releases. While the video doesn't explicitly say the trailer is coming tomorrow, the text is pretty inescapably clear. Make no mistake; we're getting our first footage tomorrow. "Something incredible is coming tomorrow." While we haven't seen any actual footage from The Incredibles 2 just yet, we know a little bit about what we can expect. For one, it's said that the sequel will pick up right where the first movie left off, with the super-powered family having to do battle with the Underminer. Brad Bird, who directed the first movie, is also back to direct the sequel. The core voice cast, including Craig T. Nelson, Holly Hunter, Sarah Vowell and Samuel L. Jackson are all back for the sequel as well. Huck Milner is replacing Spencer Fox as Dash this time around. But there's also going to be more than 20 new heroes introduced in this movie, so that means Disney and Pixar are going to have to bring in a lot more talent to bring those characters to life. Speaking of that, a new report notes that Bob Odenkirk (Better Call Saul) and Catherine Keener (Get Out) have been added to the cast of The Incredibles 2. Both actors have had a big year. Odenkirk continues to be a major player on the small screen as Saul Goodman on AMC's Better Call Saul, in addition to his role in Steven Spielberg's upcoming movie, The Post, which looks to be a major awards contender. Keener was in one of this year's biggest movies in Get Out, which also has awards potential this year. Unfortunately, The Tracking Board's report doesn't reveal any details about their characters in the sequel, but perhaps the trailer tomorrow will give us some idea. Maybe one of them will be playing the movie's new villain? The Incredibles 2 is currently set for release on June 15, 2018. Be sure to check out the trailer teaser for The Incredibles 2, courtesy of the Pixar Twitter account, for yourself below. Keanu Reeves' Toy Story 4 Character Secretly Revealed in Incredibles 2?